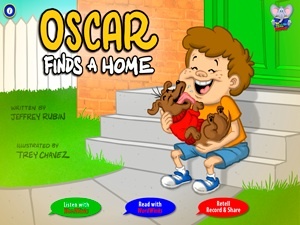 Educational app, FREE for a limited time – Oscar Finds a Home,a “You Tell Me” story. In this story, a cute little dachshund named Oscar finds himself in a dog shelter waiting to be adopted. Oscar gets more and more worried as other dogs are chosen. Just when the shelter is about to close, little Joey comes along and takes Oscar home. Cute story!